Every year in America, thousands of pedestrians die in motor vehicle accidents. In 2013, 4,735 pedestrians were killed in traffic crashes, according the U.S. Department of Transportation. Judging by historical data, 2015 will probably see a similar number of deaths. Instead of numbers, let’s focus on two names: Abbie Zukowski and Anna Lewis, both victims of recent fatal pedestrian crashes in the Lehigh Valley. Anna, an Allentown grandmother, was killed in a horrifying hit-and-run crash March 15 on Airport Road. Abbie died after being struck by a car May 18 in her hometown of Emmaus, a few blocks from her elementary school. Her death is particularly poignant because Emmaus has worked on a multi-pronged strategy to improve pedestrian safety over the last two decades. The circumstances behind the two accidents are different, but they both underscore the same point: the issue of pedestrian safety urgently needs our attention. It’s not enough to just give pedestrians tips on how to walk more safely. We can’t tell people “Use crosswalks” and “Wear bright clothing” and then continue to build out communities that don’t have sidewalks or those that regularly experience unsafe vehicle speeds. Instead, we need to push for improvements that make travel safer for people behind the wheel and on foot. When we make communities safer for pedestrians, we make them safer for everyone. Reduce speeds. According to a report by Smart Growth America, 61 percent of fatal pedestrian crashes happened on roads with speed limits of 40 mph or more. Improve your street design. Streets in both rural and urban communities should be designed for vehicles, pedestrians and bicyclists, and should accommodate people with disabilities. RenewLV supports Complete Streets as a concept that makes sense for all municipalities to adopt. Municipalities should consider planting street trees and instituting “road diets” in order improve their community’s safety and sense of place. Work together. Local government, law enforcement agencies, LANta and PennDOT should all have the same vision for making traffic safer, with input from the community as well. Improvements and enforcement are both equally important. Keep kids safe. This is our responsibility as adults. While child pedestrian deaths dropped between 2002 and 2012, that’s more of a function of fewer kids playing outside rather than the result of some larger public safety policy. Programs like Safe Routes to School make it safer for kids to walk and bike. Kids walking and biking to school has numerous health and community benefits, too, and should be encouraged. Encourage alternative transportation. “When walking biking and public transportation programs are strong, they’re in the public eye — making them more visible to drivers,” the APHA says. Public transportation — along with walking and biking — can also reduce the number of drivers on the road, leading to a better air quality, a citizenry getting more exercise and a healthier community overall. By the time you read this, another Lehigh Valley family could have gotten the same horrific phone call the Lewis and Zukowski families got. It’s not a pleasant thought, but statistics aren’t on our side. That doesn’t mean there’s nothing to be done. You can campaign in your community for planning that accommodates vehicles as well as pedestrians. You can petition your public officials to support alternative transportation. At RenewLV, we’re committed to smart transportation. That means making sure people get where they’re going safely, no matter how they choose to get there. As many of you know the Assessment Report that guides the work of the Lehigh Valley Food Policy Council sounds the alarm for the need for farmland preservation. My name is on it, but it was truly a dynamic collaborative effort of RenewLV’s Farmland Preservation Committee. It would not have happened without input from all committee members and without RenewLV board support by Julie Thomases, Dave Lobach and Ron Beitler and oversight by board chair, Michael Drabenstott. It would also not have happened or — been as powerful — without the farmland preservation facts presented by our region’s farmland preservation professionals, Jeff Zehr of Lehigh County and Maria Bentzoni of Northampton County. A sincere thank you to all of you who helped make this happen. Please feel free to share this with your friends and networks. Please post it on your wall and share it among your network of friends and supporters. 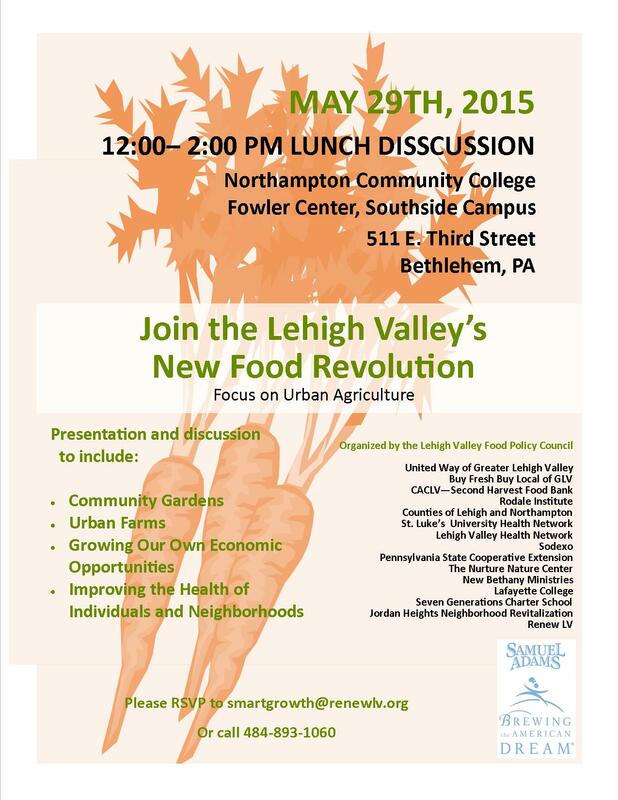 And, if you’ve been meaning to reserve your place for Friday’s 5/29 lunch/discussion at the Fowler Center on Bethlehem’s Southside from 12-2 p.m. on Urban Agriculture: Join the Lehigh Valley’s Food Revolution, we still literally have a couple of seats left. We have an informative and dynamic event lined up. More information here. Urban agriculture revolutionizes the way people are growing food all over the country, including the Lehigh Valley. That’s why RenewLV and the Lehigh Valley Food Policy Council have dedicated their latest Growing the Region’s Food Economy event to Urban Agriculture. 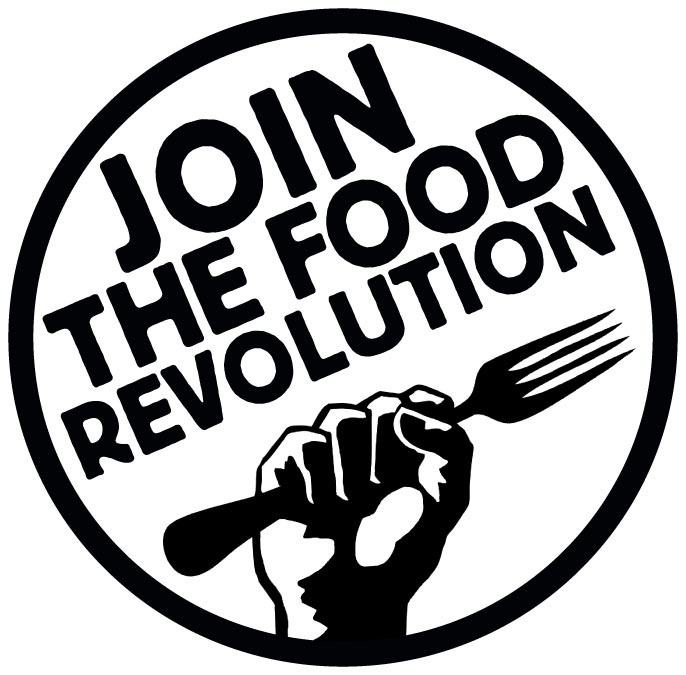 “Join the Lehigh Valley’s New Food Revolution” on Friday, May 29 from noon to 2 pm. at the Fowler Center in South Bethlehem for the third of four lunch discussion events related to growing the local food economy and hosted in partnership with the Samuel Adams, Brewing the American Dream. Food access is not a given for every resident of the Lehigh Valley. 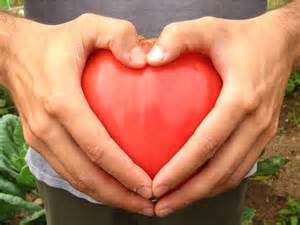 Each week, roughly 70,000 people rely on the region’s food banks in order to eat. 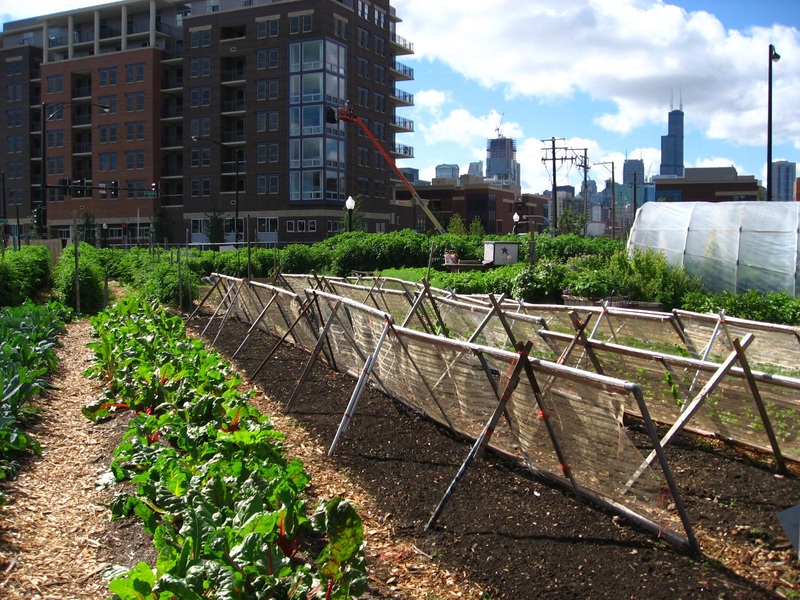 Urban agriculture can help remedy that problem. “Urban agriculture is a creative approach that can be transformational to the Lehigh Valley in growing a local food economy. It makes small scale growing ventures profitable, connects people to each other, feeds our citizens and improves nutritional health,” said Joyce Marin, Executive Director of RenewLV. Jesse Barrett from Rodale Institute will explain Rodale’s new Organic Allentown project (which includes farmers markets, growing towers and the importance of organic). Sophia Feller, Director of Urban Agriculture from the West Ward Neighborhood Partnership in Easton will describe the impact of the Easton Urban Farm that produced 1,400 pounds of food last year as well as various community gardens throughout the city). Katelyn Repash of Greensgrow, will share how this Philadelphia organization grows community through gardening, food shares, food vans, cooking demonstrations and hosting festivals and events. Lauren Blood of Triskeles, also of Philadelphia, will explain how a focus on youth education in urban agriculture (afterschool and summer programming) can create job and life skills that translate into economic opportunity for them and their neighborhoods. 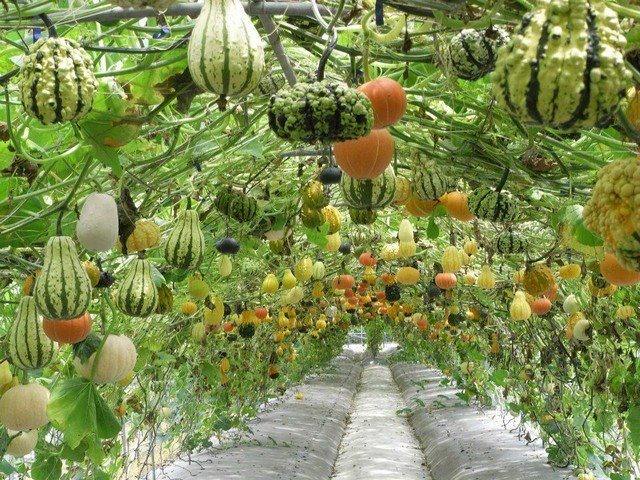 Linda Borghi, Biodynamic SPIN farmer and founder of Abundance Life Farm in Walker Valley, NY, will talk about how to make money with urban agriculture. Participants will enjoy a locally-sourced lunch provided by Sodexo at the Fowler Center in South Bethlehem, 511 E. Third St. 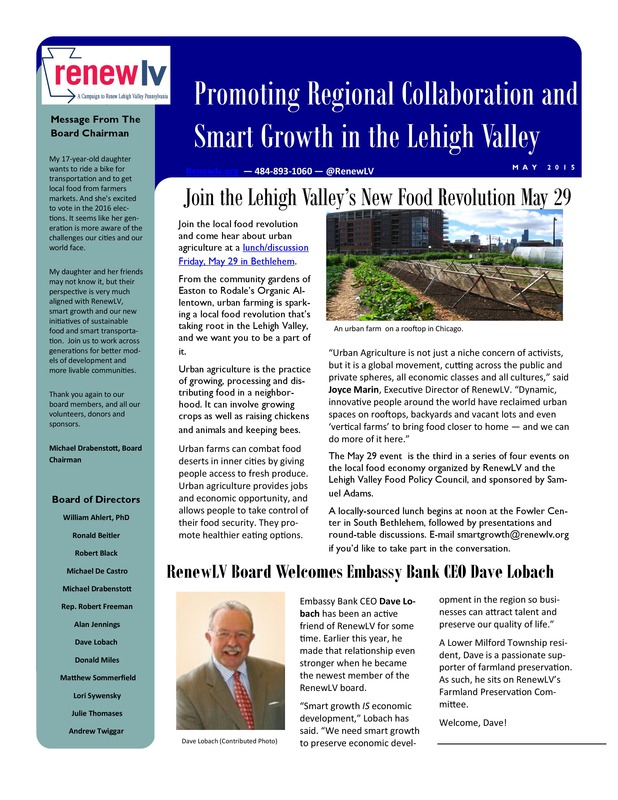 The Lehigh Valley Food Policy Council (LVFPC) is a collaboration of sixteen founding partners working together to implement the ideas in the Assessment Report: Lehigh Valley Local Food Economy, one of the reports funded by the three-year $3.4 million HUD-funded EnvisionLV process. LVFPC founders include: the United Way of the Greater Lehigh Valley, Buy Fresh Buy Local of the Greater Lehigh Valley, the Nurture Nature Center, Second Harvest Food Bank of the Greater Lehigh Valley, Rodale Institute, CACLV, Counties of Northampton and Lehigh, Lafayette College, Seven Generation Charter School, St. Luke’s University Health Network, the Lehigh Valley Health Network, Jordan Heights Neighborhood Revitalization, New Bethany Ministries, Penn State Cooperative Extension Office and RenewLV. 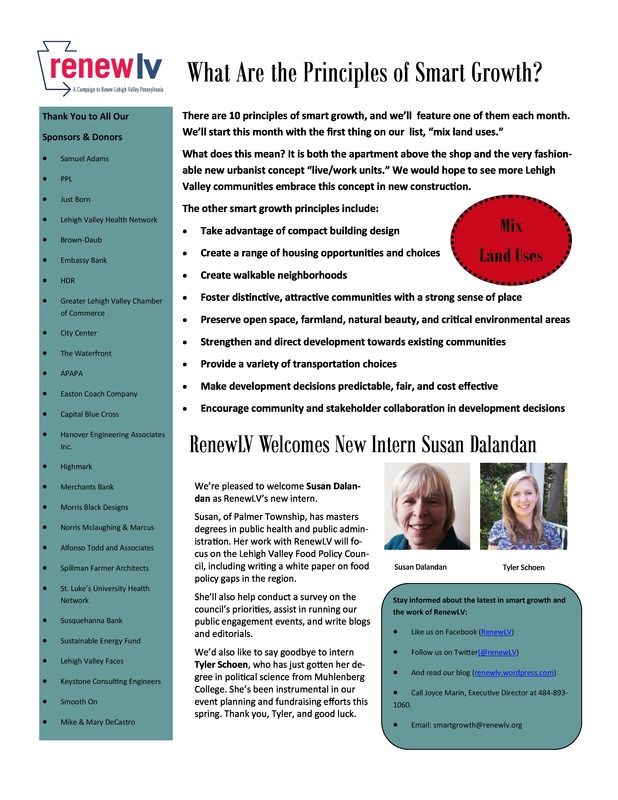 The May RenewLV Newsletter is Here! A look ahead at our May 29 lunch/discussion on urban agriculture, and look back at our March event on food entrepreneurship. 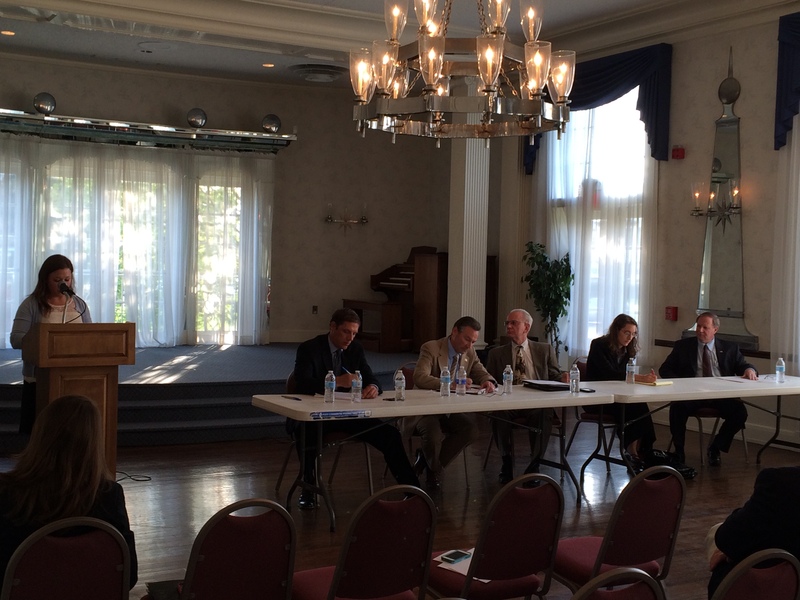 A report on the Lehigh Valley Planning Commission’s development report. 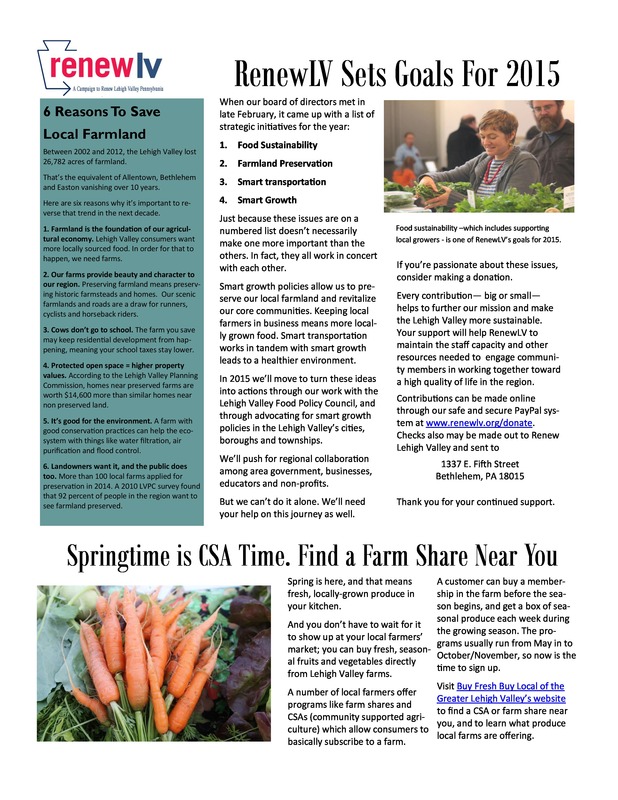 Information on finding a CSA/farmshare near you. A welcome to two new members to the RenewLV family: board member Dave Lobach and intern Susan Dalandan. On a related note, we should take a moment here to thank ALL the members of our family. We couldn’t have done any of things described below without the help of our staff, wonderful volunteers, board members, and generous sponsors. Thank you! I have heard it said that the way to change the world is to throw a better party. We're using that advice to organize a food revolution in the Lehigh Valley. This is a unique type of movement. There will be no demonstrating in the streets. It will look like a party with good conversation and tasty local food on the menu. 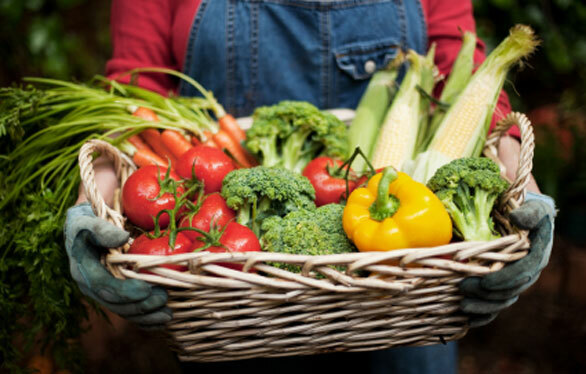 This is a revolution in which you create a powerful shift by making a simple decision about what you put on your plate and in your mouth: eat local. It turns out that you can transform your health, your neighborhood and the regional economy by thinking a little bit differently and choosing more local food. 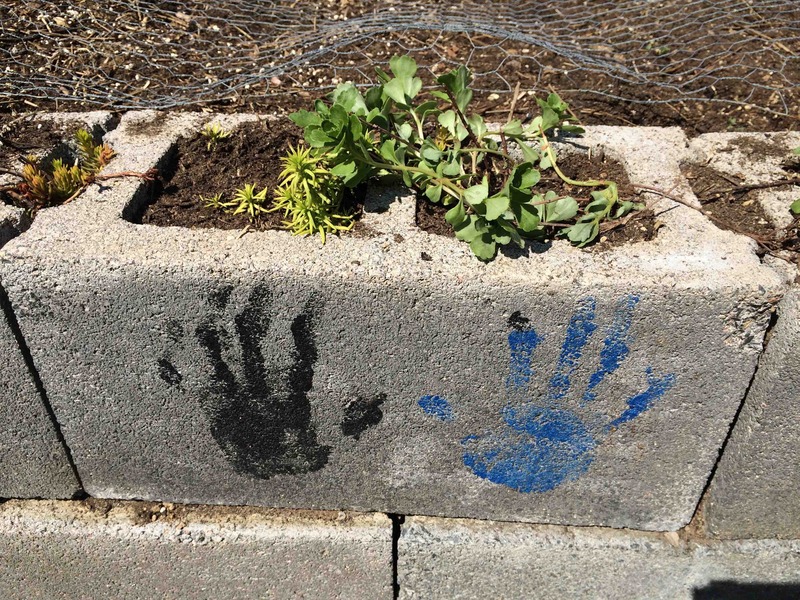 But, how do we get traction about transforming urban neighborhoods through greening efforts? On Friday 5/29 we're coming together to learn what's going on in the exciting world of Urban Agriculture in the Lehigh Valley...and beyond. We will hear about transformative ideas from people who are creating livable, sustainable, connected communities in the Lehigh Valley and in Philadelphia. You're invited to come sit at our table for lunch and a discussion to learn more about this radical but delicious idea...the Lehigh Valley's New Food Revolution. We're meeting on 5/29/15 from noon to 2 p.m. in the Fowler Center on Bethlehem's South Side at 511 E. Third Street. "Join the Local Food Revolution"
Dynamic guest speakers will tell us about projects and opportunities happening in the Lehigh Valley and beyond. We are hosting this with the support of the Lehigh Valley Food Policy council including the collaborative efforts of sixteenpartners... United Way of the Greater Lehigh Valley, Second Harvest Food Bank, Rodale Institute, Buy Fresh Buy Local of the Greater Lehigh Valley, CACLV, the Counties of Lehigh and Northampton, St. Luke's University Health Network, the Lehigh Valley Health Network, the Nurture Nature Center, Lafayette College, Jordan Heights Neighborhood, Seven Generations Charter School, Sodexo, New Bethany Ministries and RenewLV and a special thanks to our sponsor, Samuel Adams, Brewing the American Dream. 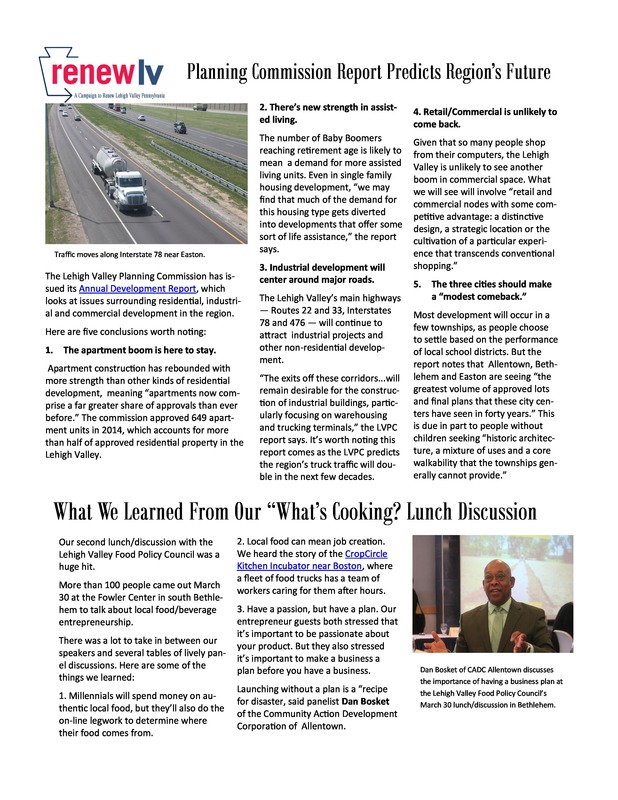 Our conversations are grounded in a larger effort to grow the local local food economy, "move from ideas to actions" and implement recommendations from Buy Fresh Buy Local's "Lehigh Valley Food Economy Assessment Report." A large part of transforming the health of our neighborhoods through urban agriculture is figuring out ways that we can remove barriers for neighborhood greening efforts. The panel discussion of knowledgable urban farming practitioners will be followed by small group table discussions where you can roll up your sleeves and craft practical solutions to challenges you face in your neighborhood. There is no cost for coming to our party, but pre-registration is essential. SEATS ARE LIMITED. Click here now to reserve your spot at our table. Our last two events were at capacity, so if you want to join us, do not delay...reserve your spot NOW. Smart Growth = Save Our Lands, Save Our Towns. When I wrote to you a couple of days ago, I told you that I would be attending Monday night’s GOP Candidates Night for Lehigh County Commission to ask where candidates stand with respect to funding farmland preservation, an important tool in saving our lands. The four winners in the primary will advance to the November election and run against the four winning Democrats. Hillary A. Smith, 36, of Lower Macungie Township, a freelance copywriter and marketing professional who serves as vice chairwoman of the Lehigh County Democratic Committee. Lehigh County in the past has allocated funds to the farmland preservation fund ranging from $2M annually from 2006-2010 to a low of 0 in 2011. In 2015 the county allocated $250,000. When the County allocates money it receives $2.50 cents in Commonwealth funding for every dollar. Compensating landowners market value for development rights (purchasing easements) is generally considered a fair and free market way to preserve farmland over the long term. Second, it’s a fact that preservation reduces local and state municipal obligations to provide services and infrastructure related to conventional suburban development. Preserving farmland can be a key component to keep taxes sustainably low over the long term. For every dollar we spend to preserve farmland that is zoned suburban it saves us .15 to .50 cents on each one of those dollars down the road. This figure is even higher if we leverage our dollars with state and county. Answers were recorded digitally, but are posted here in an abbreviated fashion. RenewLV offers no endorsements of candidates. We will continue to ask candidates questions about farmland preservation and funding strategies and let voters make up their own minds. We welcome candidates contacting our office with a full written statement on their position on funding farmland preservation that we can share with a broad audience. These excerpts were recorded with the help of Lower Macungie Township Commissioner and RenewLV board member, Ron Beitler. Thank you, Ron. Wherever you live, we hope that you mark your calendar and plan to show up at the polls as an informed citizen for the Primary election on Tuesday, May 19th.